Remember back when we first had the idea for the Airstream? There were so many things that had to fall into place. One of those was that we needed a vehicle that could tow. Someone gifted us a used nursing home van. I’ll be honest. They gave it to us because they thought it was of little value. It was big, ugly, and had a giant electric wheelchair lift in the back. It needed brakes, tires, coils, and more! We were so excited. We sent it to the shop. I steamed off the decals, and we drove that thing like crazy. It was approaching 300,000 miles when we got the bus. A few years later, when the bus broke down, it saved the day! We continued to drive it like crazy, and blew past the 300,000 mile mark. As we added another child, more instruments, and luggage into the mix it got to be a bit crowded. Everyday felt like the day we delivered the Airstream to it’s new owners. How long could we expect this thing to keep going? Michael and I began to look at Sprinter and Transit vans. Michael is the king of online research. He likes to say, “I’m really good at googling things.” He started comparing gas mileage, engine types, roof levels, and storage capacity. After a Saturday night Mass, he saw a man wearing a company polo shirt, he couldn’t help but start to ask about reliability of vans. They discussed a lot of details about needs and features. It turns out that was EXACTLY the man he needed to be talking to. 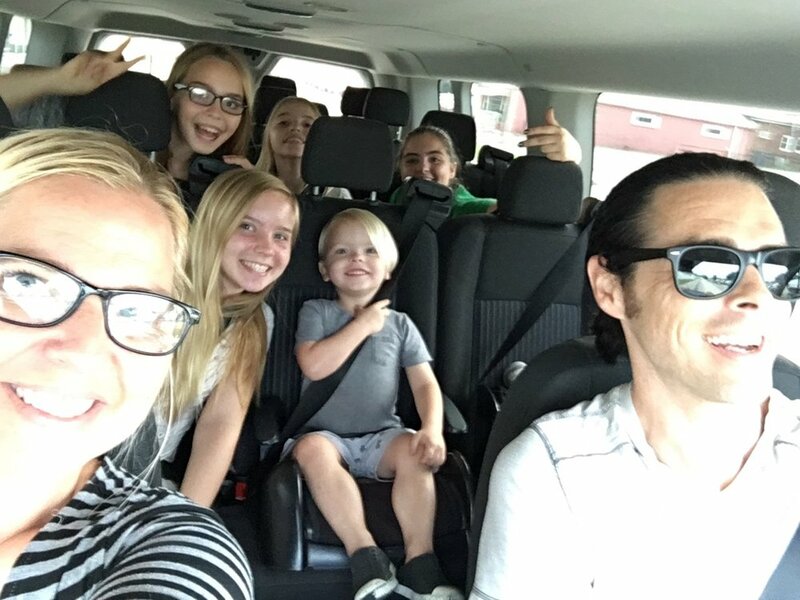 After learning about our family and our ministry, His family offered to donate the full purchase price of a new van! 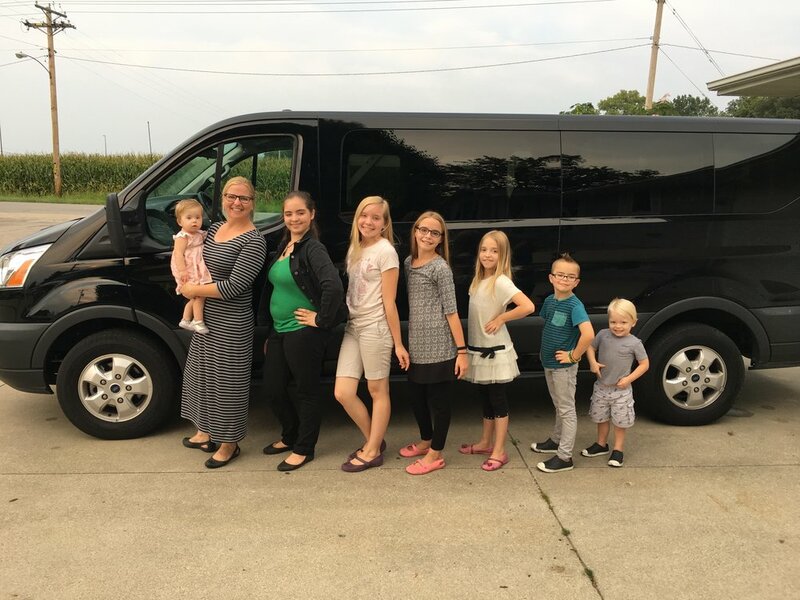 After a lot of searching and researching, Michael and I chose a black, 15-passenger, low-roof transit van with the eco-boost engine and tow package. It took a long while to get paperwork in order, but the patience paid off! We picked up our van just in time for our 2018 fall tour! Wow! What an upgrade! We love the CarPlay phone integration. The tow package includes engine braking- which is amazing! The back-up camera makes hitching the trailer a breeze! The lane detection was not something that we were looking for, but it’s a cool option to have. The kids get luxuries like rear A/C vents, cupholders, reclining seats, and charging ports. We owe a huge THANK YOU to John and Michele for their very generous donation. Having the peace of mind of a reliable vehicle is huge a huge relief. Having the van paid for gave us the opportunity get our house, add bedrooms in our basement, and get Studio B ready.